Automated vehicles are, without a doubt, the next frontier in automotive innovation. The world waits on and debates the efficacy of self-driving cars and throws around statistics about traffic fatalities to push the agenda. But a far more compelling argument exists, and no one is talking about it. BraunAbility has always held the firm belief that as many individuals with disabilities as possible should have access to mobility. Accessible vehicles allow users to gain back a modicum of independence, but many aren't able to drive themselves due to the extent of their disability. But imagine the increased independence if someone with disabilities were able to operate their own vehicle because it drives itself? Shamefully, disability advocates have been a secondary consideration when looking for allies to push for new national regulations regarding automated vehicles. Recently, the National Highway Traffic Safety Administration held a public meeting regarding "operational guidance" for automated vehicles. Recode reports Susan Henderson, executive directorof the Disability Rights Education & Defense Fund, as saying, "Without explicit inclusion of accessibility in the development of technology, their potential for bringing independence and increasing inclusion diminishes. For example, equal access to the internet for people who are blind and deaf and have other disabilities was not considered by web developers at first, and many people with disabilities experienced unnecessary obstacles to information - and still do." 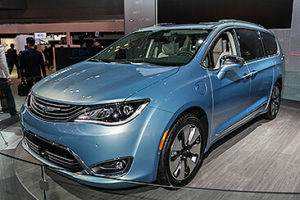 Google announced in Maythat it would be adding 100 custom-built Chrysler Pacifica hybrid minivans to its experimental fleet of self-driving cars. When we learned of Chrysler's addition of the sleek new Pacifica to its current offering of thepopular Town & Country, we jumped at the opportunity to create the best Pacifica conversion on the market. Google is proving this technology doesn't just have to be used in pod-type vehicles. Families and, maybe more importantly, people with disabilities would be able to use this technology in their day-to-day lives. Google has long hada goal of serving people with disabilities who are unable to drive. It's important, then, for lawmakers to start listening to disability advocates when it comes to advancing automated vehicle technology. Doing so is the only way to ensure people with disabilities are not an afterthought and can reap the full benefits of these vehicular advances.